You want to try EZYcount and enjoy the free registration. Click on “Try for Free” on the homepage. Or jump directly to the Register troubleshoot. 1) Click on the “Try for free” button on the homepage (open in a new window). 2) Fill up the register form with your personal information. “Title”: Your gender. We collect this information to offer you a more personal experience and to collect statistical data. “Country of residence”: The country where you live in. “Email”: You personal email. This is also your username for EZYcount independently of which company you work for. “Password”: The Password need to be at least 6 characters long with at least one letter and one number. “Terms of Services”: The Terms of Services need to be accepted to use EZYcount. Please read them carefully. Press the button “Register” when you filled all fields. If all information are correct, you should be redirected to the login page with the success message “A validation email has been sent, you need to validate your account before you can log in.” such as the picture below. If not, information are displayed within the register form to show you what is wrong. 3) A validation email has been sent to you at your email address. See example below. Please confirm your email address by clicking on the link “Validate your email”. You successfully finished the registration process! Now try to login and then create your first company or play with a test company. I have registered but I never received an email. Try to register once more. if this is successful, this means that you didn’t inputted the right email address the first time. Everything is then all right and you can start to work with EZYcount. If you cannot register and you receive the error below, you already registered. 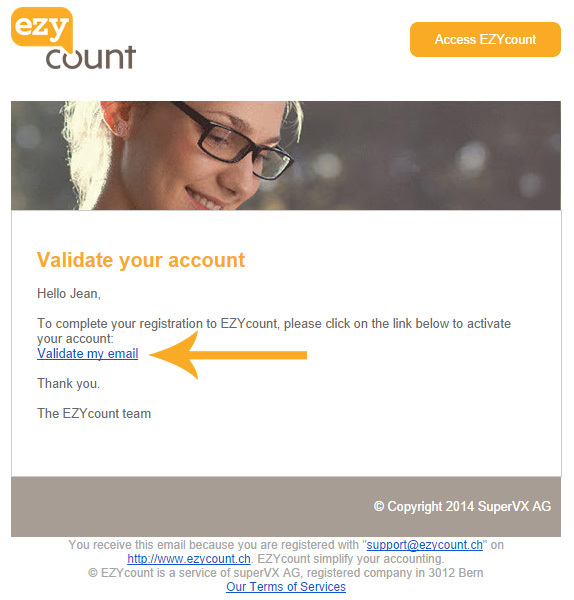 Please double check if you didn’t receive EZYcount email or if the email didn’t landed in your spam folder. 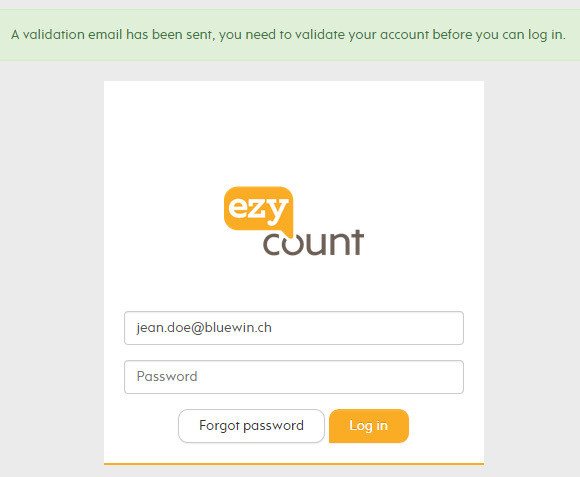 Please contact support@ezycount.ch for further support.